Francisco Freitas is a researcher who studied Sociology, Risk Analysis and Geographical Information Systems (GIS). More recently, he has been engaged on the data science field. He is a long-time partner of Verbi GmbH for the development of the Portuguese version of MAXQDA software. As a practitioner, he has taken part in several multidisciplinary research teams, holding extensive experience in the field of qualitative and quantitative research methods. His responsibilities repeatedly encompass all the stages of data collection and analysis, along with mapping and spatial analysis tools rendering. 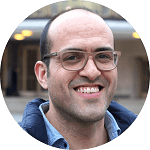 Francisco works very regularly as a software instructor, research methods lecturer, and consultant in Portugal and abroad. His special research interests include risk, regulation, research methodologies, and big data. Farinha, F., Freitas, F., Águeda, A., Cunha, I., & Barcelos, A. (2017). Concerns of patients with systemic lupus erythematosus and adherence to therapy - a qualitative study. Patient Preference and Adherence, Volume 11(11), 1213–1219. https://doi.org/10.2147/PPA.S137544. Amaral, S. V., Montenegro, M., Forte, T., Freitas, F., & Cruz, M. T. G. da. (2017). Science in Theatre - An Art Project with Researchers. Journal of Creative Communications, 97325861668896. https://doi.org/10.1177/0973258616688966. Freitas, F., Borges, M., Rosado, A., & Oliveira, R. de. (2014). Coaches’ migration: A qualitative analysis of recruitment, motivations, and experiences. Leisure Studies, 33(Mobile Lives. Migration, Migrants, and Meaningful Leisure). https://doi:10.1080/02614367.2014.939988. Freitas, F. (2013). Coding qualitative data using MAXQDA 11. In Rosaline Barbour’s Introducing Qualitative Research: A Student's Guide. London: SAGE. Retrieved from http://www.uk.sagepub.com/barbour2e.